Thank you to Raymour & Flanigan for providing the products for this space. All expressed opinions are 100% my own. This post may also contain affiliate links to products used for your convenience. A few weeks, ago, I had the opportunity to join Charlotte of At Charlotte's House for another Blogger's Heart Habitat project in Connecticut. 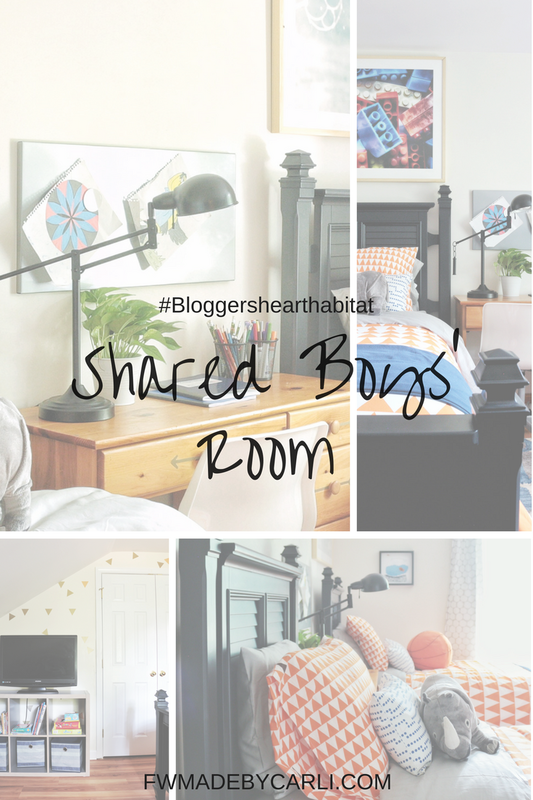 You may remember, I had my very first #bloggershearthabitat experience back in December and had so much fun, so when Charlotte asked me to join her again this August to help create a shared boys' bedroom, I couldn't say no. 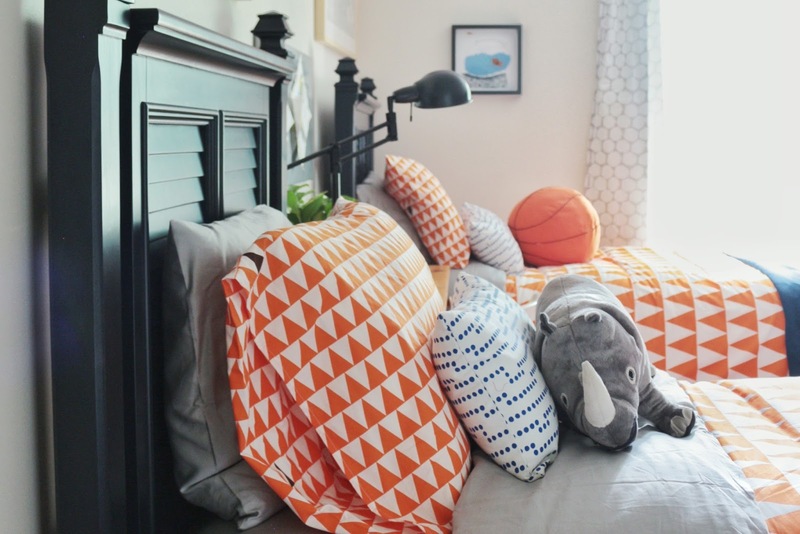 Blogger's Heart Habitat is a collaboration between Charlotte and Habitat for Humanity, of Eastern Connecticut. It's an amazing way to give back involving a deserving family, a group of budget-savvy bloggers and some amazing sponsors. In this home, I joined Charlotte, Diane of The Rath Project, Lisa of Shine Your Light, and Kris of Driven by Decor to help make this family's new house a home. Kris, Lisa and their daughters worked on transforming the living room into a beautiful tropical themed space. And Charlotte, Diane and I worked on a super sweet shared boys' room. We had so much fun together and shared many laughs and definitely some frustration (Thanks to some Ikea furniture assembly! ), and I may or may not have almost hammered Diane's thumb off on a few occasions, ha! ---but in the end it was all worth it! The best part about Bloggers Heart Habitat is the fact that we bloggers are great at budgeting, and finding the best deals to create spaces that feel like home, and that's exactly what we were able to do for this wonderful family. The biggest challenge in this room, was creating a space suitable for two boys who are eight years apart in age. So ensuring that each of the boys' needs were considered was most important. We were told that the older son loved legos and video games and coincidentally, Charlotte, Diane and I all have 2-year old boys, so we were pretty keen on what the the little guy would like. Also, Diane was able to score some awesome donations from her community of toys and books to suite both the boys ages, which helped to fill out the room and really made them feel at home. I know I've chatted enough . . . let's check out this space! 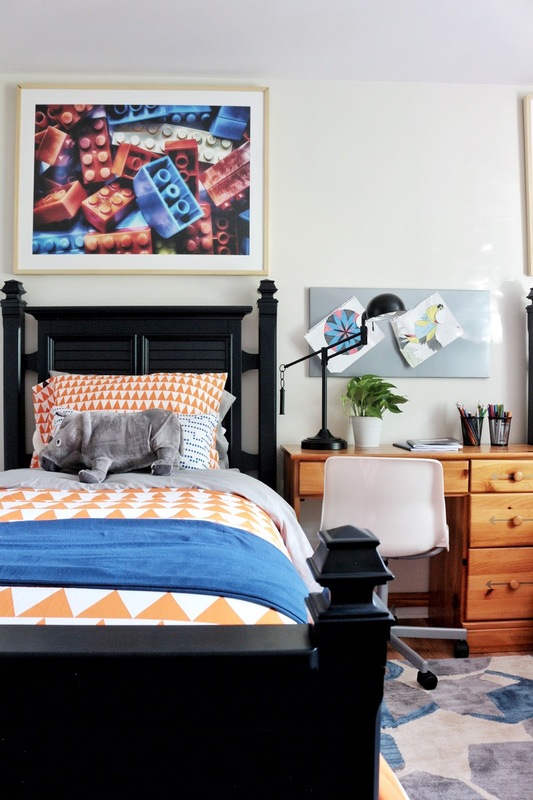 The large wall art was generously donated by Minted . . .
We just loved the navy beds, and how the orange of the duvets popped against it. Paper Riot Co. sponsored these awesome triangle wall decals-that seriously kicked the fun level in this room up a few notches! 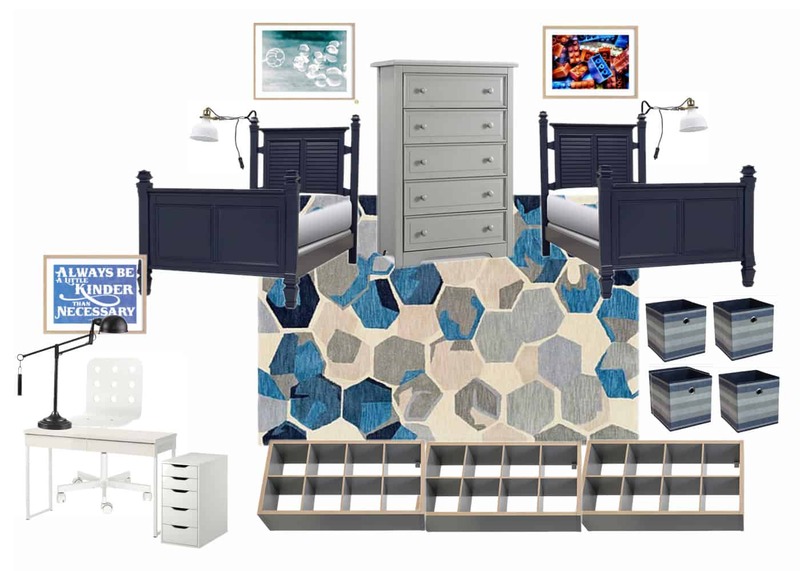 Raymour and Flanigan generously provided the beautiful twin beds, dresser, the awesome graphic rug and table lamp---they also provided us with a budget to spend on other accessories for the space as well. Simmons Mattresses graciously supplied us with twin mattresses and box springs--seriously, we couldn't be more lucky! 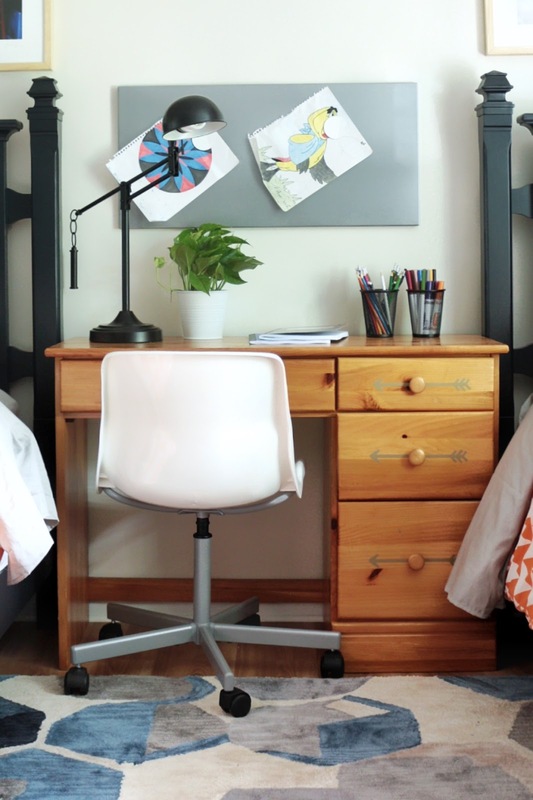 This adorable pine desk, that Charlotte and Diane scooped up at a local Habitat ReStore, serves double duty as a study space and a nightstand for the boys. We were able to jazz it up a bit with theses fun arrow decals, also from Paper Riot Co. In the far corner of the room, we set up a little table and chairs for the little guy to color or flip through books until his heart's content. 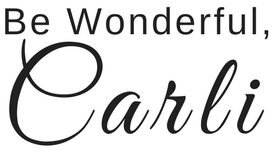 I love the sweet reminder to "always be kinder," on this piece from Minted. I don't know about you guys, but I would say this room was a success--judging how the little ones didn't want to leave their new space! To be honest, I didn't want to leave either! 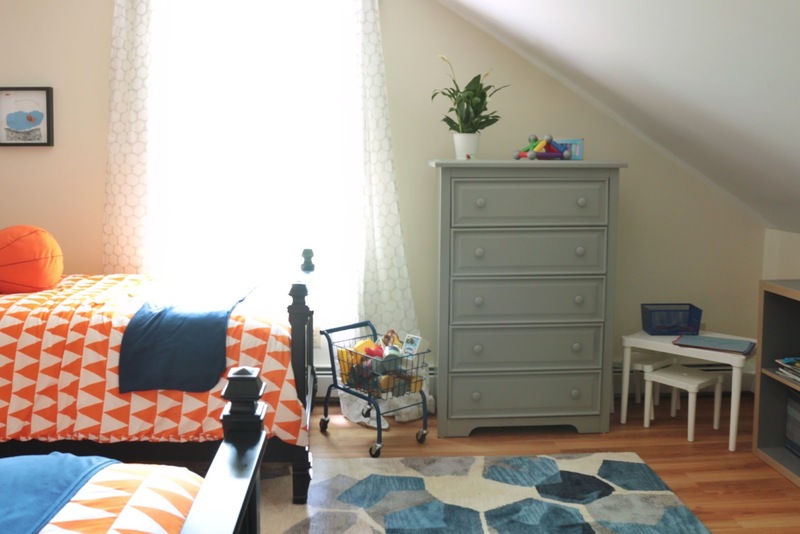 There you have it folks: A shared room for two adorable boys, completed in a day! So proud to be a part of this project again! Big thanks to Raymour and Flanigan, Minted, Paper Riot Co. and Simmons Mattresses for their generous support, which really helped to make all of this possible! The Gals, from left to right: me, Lisa, Kris, Diane, Homeowner and her children and Charlotte. If you'd like to see more pictures of this space check out Charlotte and Diane's posts. And be sure to check out how Lisa and Kris transformed the homeowner's living room into a beautiful and inviting space with a tropical feel. This is such a gorgeous room, and the use of space is so smart! Than you so much-it was so much fun working on this space! Thanks Charlotte! So honored to have been a part of this project!